New Buffalo, Michigan -- In a town with a population of just under 2,000 people, school leaders, teachers, students, and families have formed a tightly knit community where exciting changes are taking place. Many of those changes are happening in schools, as leaders think strategically about how to best support teachers and students. By leveraging the power of BetterLesson Coaching, one veteran teacher experienced “the best teaching year” of her career while a younger teacher experienced a transformative process that resulted in tremendous student growth in just under five months. How did such a change take place? In this two part series, we will highlight one teacher’s growth story and unveil the process by which her school leadership team worked closely with BetterLesson to drive student progress and teacher growth. 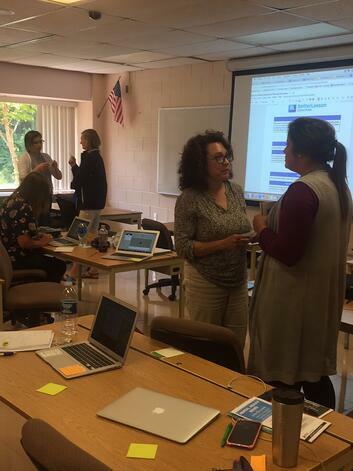 New Buffalo Teachers engage in a Design Studio 2018 led by BetterLesson Coach Julie Mason. Here they “Mix and Mingle” and share their plans for the year with each other in order to receive feedback. Morgan Edquist, a fifth grade teacher with three years of experience at the start of SY17-18, kicked off last school year with a vision for differentiating math instruction using Station Rotations. She worked collaboratively with her BetterLesson Coach, Julie Mason to design a Station Rotation model that encouraged students to engage meaningfully with technology, practice math skills independently, and receive targeted, teacher-led instruction. She began the year by modeling how to write SMART goals and supporting students to review their own assessment data and work collaboratively with peers to engage in reflective goal setting. While this strategy seemed to be going well in her classroom, Morgan was surprised when in January 2018, she received students’ math scores from the NWEA Achievement Status and Growth Summary Report. “The winter scores were shocking and they were not as good as I had hoped,” Morgan shared. Her scores revealed that only 23% or 5 out of 22 students met growth in math. In stressful situations like these, teachers and administrators might have a myriad of responses. In Morgan’s case, New Buffalo Elementary School Principal Adam Bowen chose to engage in a tough yet nurturing conversation, where he started the process by looking at data together. Adam encouraged Morgan to share the student data with her BetterLesson Coach and took the additional step of sharing the NWEA report with BetterLesson’s Partner Success Team. This opened the door for tailored conversations to take place between Morgan and Julie, and they quickly revised classroom strategies. Having too many structures and systems in place can sometimes compromise the effectiveness of classroom management. Therefore, rather than doing Station Rotations everyday, Morgan pared down to doing rotations a few days a week so that she could focus on supporting different learners. Morgan worked closely with Julie to differentiate groups based on student data so that the support is even more personalized to students’ needs. By shifting from using SMART goals to being more data focused, she gave kids with higher skills more advanced-level work and created reinforcement practices for those who needed more support. 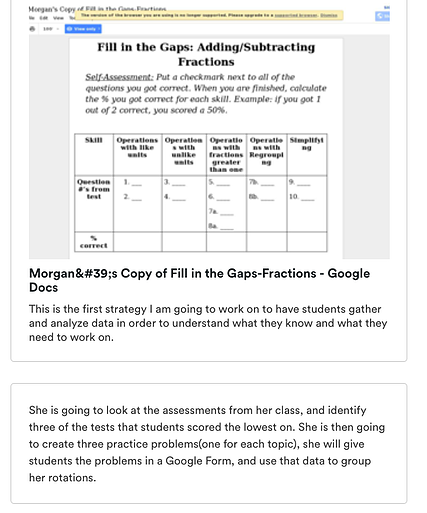 Students were tasked with reviewing their own assessment data, and when she implemented these strategies, she noticed an increase in student motivation and engagement as they began to see progress toward goals. By ensuring close alignment amongst school leaders, the Partner Success Team, and Morgan’s BetterLesson coach, Morgan saw drastic improvement in her students in just under five months. Whereas only 23% of her students met growth in math in January, by June, 85% of her students were on track! Key Ingredients for Success: What led to this transformation? Tina Lu, Partner Success Manager for New Buffalo Area Schools, credits Adam’s responsiveness to data at the midpoint of the year as a major factor in creating the supportive space Morgan needed to make pivotal changes. By encouraging Morgan to surface her challenges to Julie, and sharing that same data with the BetterLesson team, Adam fostered a close collaboration between Morgan and her coach, which affirmed the rich and nurturing coaching environment that had already been in place. In part II of the New Buffalo series, we will look at this same story from the school leadership perspective and examine a few best practices that school leaders can leverage to scale the impact of BetterLesson coaching.